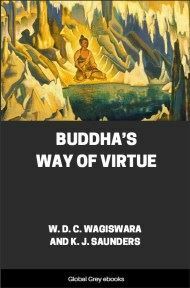 Part of the Wisdom of the East series, The Buddha's Way Of Virtue is a translation of the Dhammapada, which is a collection, in verse form, of the sayings of Buddha. For the proper understanding of Buddhism these opening stanzas are all-important. One of the Buddha's key-thoughts was what modern psychologists call the "law of apperception": the value of things depends upon our attitude to them. 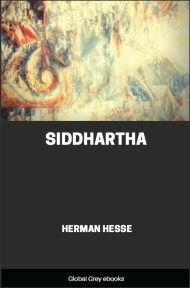 Part of Gautama's work of reform was a "transvaluation of values," a shifting of emphasis; and, like the Stoics, he taught the indifference of the things of sense. "Men are disturbed," said Epictetus, "not by things, but by the view they take of things." 1. Mind it is which gives to things their quality, their foundation, and their being: whoso speaks or acts with impure mind, him sorrow dogs, as the wheel follows the steps of the draught-ox. 2. Mind it is which gives to things their quality, their foundation, and their being: whoso speaks or acts with purified mind, him happiness accompanies as his faithful shadow. 3. "He has abused me, beaten me, worsted me, robbed me"; those who dwell upon such thoughts never lose their hate. 4. "He has abused me, beaten me, worsted me, robbed me "; those who dwell: not upon such thoughts are freed of hate. 5. Never does hatred cease by hating; by not hating does it cease: this is the ancient law. 6. If some there are who know not by such hatred we are perishing, and some there are who know it, then by their knowledge strife is ended. 7. As the wind throws down a shaky tree, so Mara (Death) o’erwhelms him who is a seeker after vanity, uncontrolled, intemperate, slothful, and effeminate. 8. But whoso keeps his eyes from vanity, controlled and temperate, faithful and strenuous, Mara cannot overthrow, as the wind beating against a rocky crag. 9. Though an impure man don the pure yellow robe (of the Bhikkhu), himself unindued with temperance and truth, he is not worthy of the pure yellow robe. 10. He who has doffed his impurities, calm and clothed upon with temperance and truth, he wears the pure robe worthily. 11. Those who mistake the shadow for the substance, and the substance for the shadow, never attain the reality, following wandering fires (lit. followers of a false pursuit). 12. But if a man knows the substance and the shadow as they are, he attains the reality, following the true trail. 13. As the rain pours into the ill-thatched house, so lust pours into the undisciplined mind. 14. As rain cannot enter the well-thatched house, so lust finds no entry into the disciplined mind. 15. Here and hereafter the sinner mourns: yea mourns and is in torment, knowing the vileness of his deeds. 16. Here and hereafter the good man is glad: yea is glad and rejoices, knowing that his deeds are pure. 17. Here and hereafter the sinner is in torment: tormented by the thought "I have sinned"; yea rather tormented when he goes to hell. 18. Here and hereafter the good man rejoices; rejoices as he thinks "I have done well": yea rather rejoices when he goes to a heaven. 19. If a man is a great preacher of the sacred text, but slothful and no doer of it, he is a hireling shepherd, who has no part in the flock. 20. If a man preaches but a little of the text and practises the teaching, putting away lust and hatred and infatuation; if he is truly wise and detached and seeks nothing here or hereafter, his lot is with the holy ones.